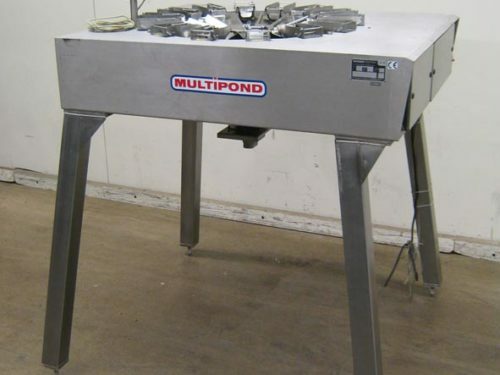 Stainless steel, dual lane, bulk / trickle scale capable of weighs up to 200 lbs (100 lbs per lane). Features 1 3/4 cu.ft. (3000 cu.in.) weigh buckets, 100"H infeed, 63 1/2"H discharge, two 30"L x 15"W x 6"deep vibratory pans per lane, bottom pan with a 2"W trickle, and stop gates for bulk feed of lower pan. Equipped with Control Technology automation controller, push button controls with LED display, foot pedal activation, low product detection sensor, and vibratory isolated control panel. Mounted on an epoxy coated mild steel base.